Happy Thanksgiving! Having a gratitude attitude helps our health, emotions and mind! Our Team sends you warm wishes for a very happy and thankful season. In spite of the economy, there is much for which to be grateful. We are especially grateful for our clients! Freezing temperatures have already arrived. Be sure everything is WINTERIZED! Pipes, sprinkler systems, evaporative coolers, and, etc., are all in need of your immediate attention! 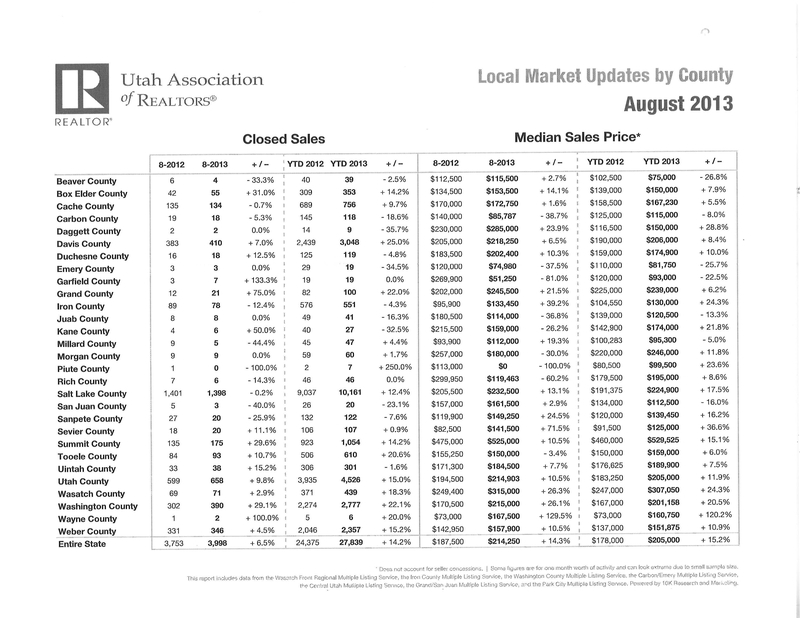 Attached is the Utah Association of REALTORs (UAR) Local Market Updates by County for August 2013. It takes the UAR approximately 2 or 3 months to compile these statistics, so this is the latest report available. Iron County reports 4.3% less sales year to date (YTD) in 2013 than 2012. The median price has risen to $130,000 YTD which is a 24.3% increase as compared to 2012. See the attached UAR report to compare all counties in Utah. Attached also are the Iron County Board of REALTORs (ICBOR) market graphs from 07/01/2013 through 10/29/2013, which include sales from all real estate offices. ERA Realty Center is still #1 with more sales than any other office. The graphs show 126 homes sold under $99,999 and 215 homes sold from $100,000 to $199,999. More homes sold under $200,000 than all other price ranges put together. 366 single family homes sold during this period of time. 10 mobile homes, 82 condo/townhouses, 134 lots, 20 acreage parcels, and 1 farm/ranch sold also. Obviously single family homes win the race which explains why the home inventory is dwindling. There are over 1400 parcels of land on the market which is a huge oversupply compared to # of sales. Commercial property and development property are low in demand in the current market. 1. Aggressive marketing locally as well as nationally and worldwide to buyers and real estate agents. I do not know of anyone that markets more aggressively than the Naisbitt-Bagley Team on TV, radio, real estate magazines, and online with featured ads, banner ads, optimized websites and much more. Ask for a copy of their amazing global advertising online. They even pay the Chamber of Commerce to send their homes and properties to everyone that contacts the Chamber. They try to advertise wherever a buyer might be including to the real estate agents all over. They may not be the ones that sell their home and property listings, but their aggressive advertising will be the reason for the sale! They will continue to market aggressively. 2. Market Price. If the home or property hasn’t sold in 30 days, a market reduction in price is probably needed. With our aggressive marketing, there should be action and offers. If not, please call the Team for a market value overview. We will continue to market at the price the seller sets. 3. Show-Perfect. When the buyer tours a home or views a property, it must be beautiful to attract an offer. The Naisbitt-Bagley Team is trained in helping sellers stage and prepare their real estate to show at its best. Please call today for your free consultation. 4. Available for Showings. Homes and properties must be available to be seen when the buyer is available to see them. It is difficult to schedule around the seller’s time. Lockboxes are ideal. It is a great time to buy and sell. Buyers are buying and interest rates are excellent. Take a look at the homes for sale at www.findhomesincedarcityut.com. Bargains are available. For questions, concerns, and for your free consultation about making your realty goals a reality, please contact the Naisbitt-Bagley Team today at 435-865-1019, email naisbitt@inxsnet.com, or text 435-559-7772 today. We work hard to help you make your real estate dreams come true.